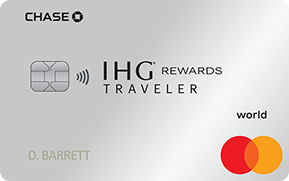 Interested in our IHG® Rewards Club Traveler Credit Card? after spending $2,000 on purchases in the first 3 months. IHG® Rewards Club Traveler Credit Card? This product is not available to either (i) current cardmembers of this credit card, or (ii) previous cardmembers of this credit card who received a new cardmember bonus for this credit card within the last 24 months. You will qualify for 80,000 bonus points if you make $2,000 in purchases within 3 months of account opening; if you make an additional $3,000 in purchases (for a total of $5,000) within 6 months of account opening, you will qualify for an additional 40,000 bonus points (for a total of 120,000 bonus points). After qualifying, please allow 6 to 8 weeks for bonus points to post to your account. ("Purchases" do not include balance transfers, cash advances, travelers checks, foreign currency, money orders, wire transfers or similar cash-like transactions, lottery tickets, casino gaming chips, race track wagers or similar betting transactions, any checks that access your account, interest, unauthorized or fraudulent charges, and fees of any kind, including an annual fee, if applicable.) To be eligible for this bonus offer, account must be open and not in default at the time of fulfillment. How you can earn points: You'll earn points when you, or an authorized user, use an IHG® Rewards Club credit card to make purchases of products and services, minus returns or refunds. Buying products and services with your card, in most cases, will count as a purchase; however, the following types of transactions won't count and won't earn points: balance transfers, cash advances and other cash-like transactions, lottery tickets, casino gaming chips, race track wagers or similar betting transactions, any checks that access your account, interest, unauthorized or fraudulent charges, and fees of any kind, including an annual fee, if applicable. 10 points: You'll earn 10 points for each $1 spent on purchases made at InterContinental Hotels Group properties, including InterContinental® Hotels & Resorts, InterContinetal Alliance® Resorts, Kimpton® Hotels, Crowne Plaza®, Hotel Indigo®, Holiday Inn®, Holiday Inn Express®, Holiday Inn Resort®, Holiday Inn Club Vacations®, Staybridge Suites®, Candlewood Suites®, EVEN™ Hotels and HUALUXE™. 2 points: You'll earn 2 points for each $1 spent in the following rewards categories: gas stations; grocery stores; and restaurants. 1 point: You'll earn 1 point for each $1 spent on all other purchases. 10,000 bonus points each account anniversary year: You'll receive 10,000 bonus points each account anniversary year during which at least $20,000 is spent, and one additional purchase is made at least one day after you have spent $20,000. "Account anniversary year" means the year beginning with your account open date through the first statement after the anniversary of your account open date, and each 12 billing cycles after that. Information about earning/transferring points to IHG Rewards Club: Points earned during a billing cycle will be automatically transferred to IHG Rewards Club after the end of each billing cycle. Points expiration: The points transferred to your IHG Rewards Club account will not expire as long as there is IHG Rewards Club program activity for 12 consecutive months, depending on your status. IHG Rewards Club Membership terms and conditions apply. For complete program details, visit ihgrewardsclub.com. Losing points: You'll immediately lose all points that haven't been transferred to IHG Rewards Club if your card account status changes, or your card account is closed for program misuse, fraudulent activities, failure to pay, bankruptcy, or other reasons described in the terms of the Rewards Program Agreement. Rewards Categories: Merchants who accept Visa/MasterCard credit cards are assigned a merchant code, which is determined by the merchant or its processor in accordance with Visa/MasterCard procedures based on the kinds of products and services they primarily sell. We group similar merchant codes into categories for purposes of making rewards offers to you. Please note: We make every effort to include all relevant merchant codes in our rewards categories. However, even though a merchant or some of the items that it sells may appear to fit within a rewards category, the merchant may not have a merchant code in that category. When this occurs, purchases with that merchant won't qualify for rewards offers on purchases in that category. Purchases submitted by you, an authorized user, or the merchant through third-party payment accounts, mobile or wireless card readers, online or mobile digital wallets, or similar technology will not qualify in a rewards category if the technology is not set up to process the purchase in that rewards category. For more information about Chase rewards categories, see www.Chase.com/RewardsCategoryFAQs. Anniversary Free Night will be available for redemption on your account renewal anniversary date each year. ("Anniversary" is the date that is twelve months after your account open date, and the same date each twelve months thereafter.) Annual fee applies. For pricing details, please see Pricing & Terms. Anniversary Free Night is valid at IHG® Hotels with a current point redemption level of 40,000 points or less, and must be redeemed, and stay must be completed, within 12 months from date of issue. Visit IHG.com/AnniversaryFreeNight for a list of hotels that do not accept the Anniversary Free Night certificate. Anniversary Free Night is valid for one standard room night rate and applicable taxes only. Rooms are limited, subject to prior sale and availability of allocated resources and may be unavailable during high demand periods. All reservations that will utilize the Anniversary Free Night can be booked online at ihgrewardsclub.com or by calling IHG® Rewards Club at 1-877-318-5890. Anniversary Free Night may not be transferred, extended beyond the expiration date, redeemed for cash, or re-credited for points. Individual hotel's cancellation policy applies to the use of the Anniversary Free Night. Cancellation fees apply if cancellation is made outside of the hotel's cancellation time period. Anniversary Free Night rules and regulations are subject to change. To receive Anniversary Free Night communications, members must maintain a valid email address in the IHG Rewards Club member profile and opt in to receive IHG® Rewards Club e-communications. Chase is not responsible for offer fulfillment. Chase may close your credit card account or suspend your right to use your credit card account, at any time for any reason, including account inactivity. Save at least 20% on points purchases when you pay for those points with your IHG® Rewards Club Premier or Traveler Credit Cards. Point purchase amounts are subject to change by IHG® Rewards Club. These points are Non-Qualifying points and do not count towards Elite qualification. Upon completion of the points purchase, you agree that the total dollar amount of the points, minus the discount, will be immediately charged to your credit card. The cost for the points purchased is non-refundable. The 20% discount cannot be combined with any other points purchase offer. Point purchase transactions managed by Points.com. To be eligible for this statement credit you must use your IHG® Rewards Club Credit Card to either complete the Global Entry application and pay the $100 application fee, or complete the TSA Pre✓® application and pay the $85 application fee. A statement credit will be processed after the Global Entry program application fee OR TSA Pre✓® application fee (whichever program is applied for first) is charged to your IHG® Rewards Club Credit Card. You are entitled to either: one (1) $100 statement credit per account, OR one (1) $85 statement credit per account, every 4 years in connection with the Global Entry or TSA Pre✓® program application fee. The statement credit will be posted to your account within 24 hours of the Global Entry or TSA Pre✓® program application fee being charged to your card. You are responsible for payment of all charges until the statement credit posts to the account. Global Entry is a U.S. Government program, operated by U.S. Customs and Border Protection (CBP). TSA Pre✓® is a U.S. Government program, operated by the U.S. Transportation Security Administration (TSA). Chase has no control over either program including, but not limited to, applications, approval process or enrollment, or fees charged by CBP or TSA, and no liability regarding the Global Entry or TSA Pre✓® programs. For complete details on the Global Entry program, including full terms and conditions, go to ttp.cbp.dhs.gov. For complete details on the TSA Pre✓® program, including full terms and conditions, go to tsa.gov. Websites and other information provided by government agencies are not within Chase's control and may not be available in Spanish. To be eligible for this benefit, your account must be open and not in default at the time of statement credit fulfillment. Points accrued and awards issued are subject to the terms and conditions of the IHG® Rewards Club program. Click here for complete terms and conditions of the IHG® Rewards Club program, including all redemption values, or refer to www.ihgrewardsclub.com. Terms and conditions of the IHG® Rewards Club program may be modified and services and benefits may be added or deleted at any time without notice to Cardmembers. 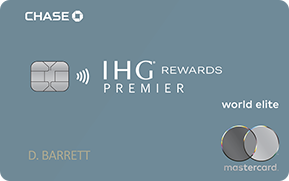 Individuals whose request for a credit card are not approved will not be enrolled in the IHG® Rewards Club program through this offer, although existing IHG® Rewards Club memberships will not be affected. Additional authorized users will not be enrolled in the IHG® Rewards Club program as a result of this offer. IHG® Rewards Club points awarded through the use of the authorized user's card will only be credited to the Primary Cardmember's IHG® Rewards Club account. Click here to review the IHG® Rewards Club Privacy Statement.